The cryptographic identity validation service Keybase has added end-to-end encrypted chat to rival WhatsApp and iMessage. The gold standard of secure private messaging requires end-to-end encryption between the parties involved with no way for the messaging service to obtain the keys used to scramble the message. Open Whisper Systems’ Signal Protocol and Signal apps implement seemingly the best version of that. But there’s a small problem: the Signal apps are tied to your phone number, and Open Whisper uses a registration system to match you and find others. Companies like WhatsApp (part of Facebook) have taken the Signal Protocol and built it into their apps, but they have a similar problem of centralized management, even though it’s done well. However, neither WhatsApp nor Open Whisper can obtain the keys involved in chats because of how the system was designed, which is what’s important. Apple’s iMessage is secured end-to-end, but a weaker design makes it feasible (if unlikely) that Apple could revise the system without users being aware to reduce the ability for messaging to remain absolutely private. This is where a new, modest offering fits in from Keybase, a company centered on user-controlled ownership of identity using cryptographic elements, where said identity is proven and validated through social media accounts, websites, Bitcoin, and other methods. 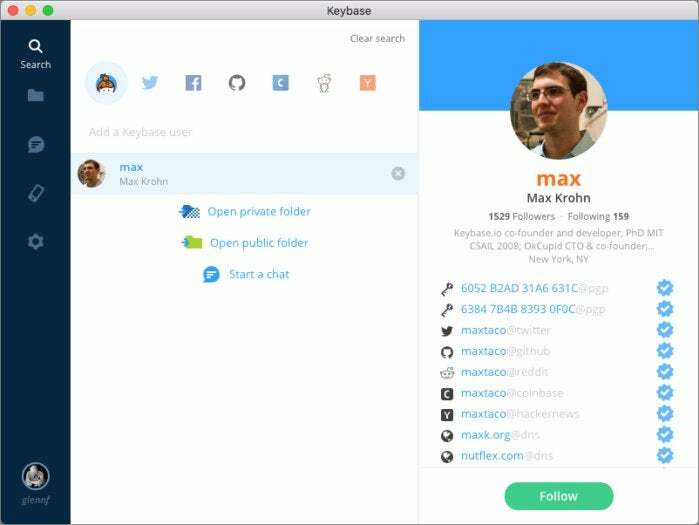 Keybase has just introduced an end-to-end encrypted chat option that relies entirely on cryptography and validation that’s in your control. I’ve written about Keybase before, because I admire the combination of approaches they’re taking to provide a simplified strong identity. The firm’s code is open source, allowing validation, and they rely on open-source software for some of the fundamental parts of what they do. The secret sauce is binding it together into a graphically pleasing and user-comprehensible format, even for those people who have zero interest in or knowledge of the underlying details. Desktop software introduced a year ago helps a lot. Keybase centers around a PGP-style key, a format that dates back over 20 years. PGP combines the power of public-key cryptography with simpler symmetrical encryption for speed. It’s effectively how SSL/TLS works for Web and email encrypted sessions. A PGP key comprises a public/private key pair, in which fiendishly complicated math allows the creation of two intertwined keys. Knowing one doesn’t help you in any way determine the other. One key is public (hence “public-key cryptography”) and can be distributed freely. The other is private, and you must protect it at all costs. To encrypt a message to one or more people with PGP, you obtain their public keys, and an algorithm encrypts a strong session key—one that can both encrypt and decrypt—with each public key. The message is encrypted with the session key, but only a recipient with an associated private key can retrieve the session key and then decrypt the message. PGP encryption renders the results impenetrable to anyone without the corresponding private key. You can also create a file signature, which verifies that a document was unchanged since you signed it. The file is run through a “hashing” algorithm that creates a unique numerical representation that is encrypted by the sender’s private key. Any recipient can take the original document and run it through the same algorithm, then user the sender’s public key to decrypt the signature and confirm the document remains unchanged. Only someone with the private key can create a valid signature that the public key decrypts. Cofounder Max Krohn says, “If someone came into our office and put a gun to our head, and said, ‘Guys, we’re going to need you to give out the wrong cryptographic credentials for this user,’ we’d have to say we can’t do this.” Even if Keybase’s systems were breached, only encrypted data would be leaked, requiring users’ keys and passphrases to unlock. Keybase launched in 2013 to solve a couple big issues with PGP keys: how to find other people’s keys and verify they were legitimately in use by the party you were thinking of. Before Keybase, most PGP exchange was either personal (literally in person or verified through a website) or through publicly run keyservers, which are full of outdated junk, and sometimes contain dozens or hundreds of keys for a single person—without any way to figure which are valid. A user’s Keybase profile includes all the proofs associated with their identity. 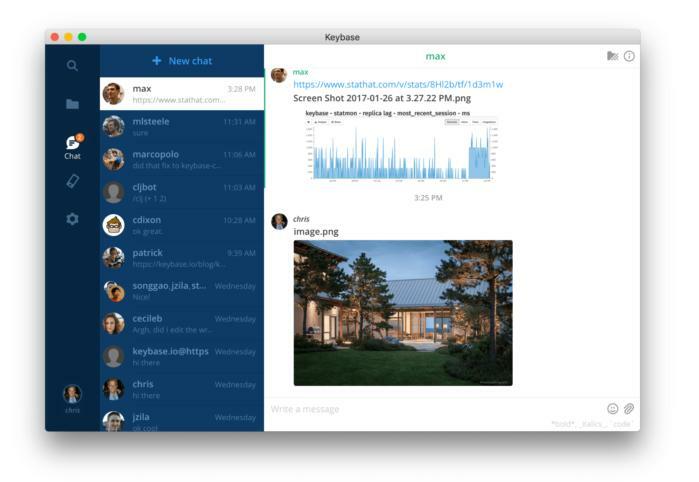 Keybase has now extended this to chat, currently available for Windows and macOS. Mobile versions are the next priority. The interface is nice and simple, and in my testing worked just fine. These chats differ significantly from every other ecosystem of any scale out there, because you absolutely control the keys used, and all associations for proof are ones you choose and can revoke at will, breaking your proof of who you are, which in turn lets everyone chatting or engaged in any interaction with you know. The Signal apps don’t allow that kind of warning to be disabled, but do let someone register a new device with the same phone number. That will alert any party in conversation, but the phone number remains the single point of verification. Signal and WhatsApp aren’t worse, by any means, but Keybase’s chat offers a reasonable set of different validation and syncing options. 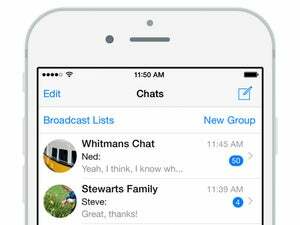 Keybase doesn’t rely on PGP for chats, as PGP is unwieldy for messaging and large-scale use. Rather, it generates a different kind of public/private paired key that’s unique for each device. Keybase tracks devices added and posts an online, uh, paper trail for transparency, and you can revoke any device from your account. When you add a device, you also get an offline key for recovery, keeping encryption under your control. Krohn says the company is considering a mode that would offer Signal-like protections, effectively locking a message to a single device and be able to “burn” them later, rendering them irretrievable. But it’s definitely a weakness that’s known about PGP and other static public-key systems in general and Keybase in particular: another party obtaining your private key can read all messages ever encrypted with it. As a result, you can make different choices about what you protect, whether files or messages, using Keybase. This is kind of a mess to pull off in any other fashion on a Mac, especially with the demise a few years ago of an alternative to encrypted disk images. Dropbox doesn’t allow user-controlled encrypted directories, and disk images are a messy way to manage this. Keybase is the only reasonable solution I’ve found, and I look forward to this moving into full release. Another excellent part of the filesystem option, though, is being able to share encrypted directories with other people—this is how chat transcripts and associated files are stored—and access publicly shared directories from verified people. Keybase is definitely a glimpse of a user-centric cryptographic future that requires less training to use, less dependence on infrastructure that’s proprietary and limited, and more ownership of your secure pieces. Right now, it remains in a semi-invitation mode. Keybase routinely opens up access to new accounts, but to avoid spammers taking advantage of free storage, you might not always be offered a chance to create an account. Look for people with existing Keybase accounts, like yours truly, if you need an invitation. Correction: This column originally stated Keybase used PGP for its chat system and encrypting filesystems, but it’s a different public-private key algorithm, linked to the same Keybase core identity.